It’s a special time of year for us Philadelphians when the cold weather washes away and brings the enjoyable warm weather into our city. With spring in the air, you notice more people smiling. Don’t let your teeth hold you back from smiling this year. During the whole month of March, you can change your smile completely with our monthly special of buy 6 veneers and get 2 for free. If you struggle with stains on your teeth that won’t go away or your teeth are misaligned, but you don’t want to take the time to get braces, veneers are the perfect solution for you. With 2 easy appointments at our Center City, Philadelphia office you can have that smile you always dreamed about. Porcelain veneers are extremely thin just like a contact lens and are custom made to give you an all-natural beautiful looking smile. The veneers are placed over your natural teeth and bonded on by our experienced dental team. At Philly Dentistry we have done the most veneer cases in Philadelphia which means we have the most experience than any other dental office. We have professional athletes, celebrities and musicians that come to our office to get a beautiful smile makeover with porcelain veneers. What you can expect when getting porcelain veneers. First, you will come to our office for a free new patient consultation so the doctors can evaluate your smile and we can give you the best results to match your natural teeth. If porcelain veneers are the right choice for you, we will then make impression of your teeth so your veneers are custom made for your unique smile. After we get your veneers back from our trusted lab one of our great doctors will prep you by removing around ½ millimeter of your tooth enamel. After that is done they will bond the veneers by placing a special cement on the veneer and then placed on your tooth. Porcelain veneers can last up to 15+ years and are stain resistant as long as you take care of your teeth by going to your routine cleanings and checkups every 6 months. So, what are you waiting for? This is the year to smile more and there is no better time than now. Give us a call today to schedule a free new patient consultation and achieve that smile you’ve always wanted with Philly Dentistry 215-568-6222. Smiling is important to do in your every day life. Smiling reduces stress and increases happiness. While some people may be too embarrassed to smile because they don’t like the way their teeth look, there’s many options we offer at Philly Dentistry to give you a smile makeover so you can smile with confidence. When a stressful situation happens, you are not thinking about smiling because you’re too stressed, but that smile might be the thing you need the most. Published in the Psychological Science showed a study by Tara Kraft and Sarah Pressman that smiling reduces the body’s heart rate during stressful situations. One service we offer at Philly Dentistry to improve your smile is Invisalign. Invisalign is the easiest and quickest way to straighten your teeth. No more metal brackets and wires! Click here to find out if you are a candidate for Invisalign. When you think of someone that is happy you think of them smiling, but did you know smiling creates a chemical reaction in your brain that produces dopamine and can make you even happier. It’s easy, smile more and you’ll be happier, but maybe you don’t like smiling because of the way your teeth look. At Philly Dentistry in just two easy visits you can completely change your smile with porcelain veneers. Porcelain veneers can correct just about any flaw you have with your teeth and give you that smile you always wanted. Learn more here about how porcelain veneers can change your life! The power of smiling is a real thing and now that you know how important your smile really is, give us a call today to schedule a free new patient consultation. Let our experienced doctors give you a free exam and tell you how they can improve your smile. 2019 is your year to smile more without stress and even more happiness so don’t push it off any longer. Call today 215-568-6222 for all your dental needs. We never want to damage our teeth on purpose, but unfortunately accidents happen. Chipping your teeth could leave you feeling embarrassed to talk, smile, and even cause you pain. The enamel on your teeth is one of the strongest materials in your body, but it does have its limits. *Biting down on something hard like candy or ice. *Playing sports without wearing a protective mouth guard. *Grinding your teeth can cause chipping. When you chip your teeth there are many risks that are involved such as, tooth decay and cavities that can wear down your enamel and weaken your teeth. This will cause more teeth to chip or crack. Anytime you wear down your enamel from grinding your teeth, eating acid-producing foods like fruit juices, coffee and even spicy foods will weaken the enamel and put you at a higher risk of chipping your teeth. The enamel wears down on your teeth as you age, so it is important to make sure you go to your routine checkups every 6 months so the dentist and hygienists can let you know what to do to protect your teeth from any chips or cracks. Treatment for chipped teeth really depends on the location of the tooth. There are different options for chipped teeth and our great doctors will evaluate the problem and let you know what the best option is for your specific case. The first option could be tooth reattachment. This option is if the fragment of the tooth has a clean break. If so, place the tooth in a glass of milk. The calcium from the milk will help the tooth stay alive. After that, it is important that you see the dentist right away so they could cement the broken piece back onto your tooth. The next option for a chipped tooth is bonding. The porcelain composite is cemented onto the surface of the broken tooth and shaped to look natural. An ultraviolet light is then shined on the area to harden the material. The dentist will then again shape the material so that it fits perfectly with your other teeth to give it an all-natural look. Another option will be a porcelain veneer. The first step with a porcelain veneer is that the dentist will smooth down some of your tooth’s enamel making room for the porcelain veneer. Typically, the dentist will smooth away about less than a millimeter of the tooth’s enamel. Next, an impression of your tooth will be made by our excellent dental assistants and then sent over to our trusted lab so they can create an all-natural looking veneer. In the meantime, when your veneer is being made at our lab we will place a temporary veneer on. When we receive your veneer back at our office the dentist will bond it to the chipped tooth making it look like nothing ever happened. Porcelain veneers can last up to 25 years will proper care! Overall, chipped teeth are a very common dental injury, but in most cases, it doesn’t cause any great pain and can be easily treated at our Center City, Philadelphia office. Although, it is not considered a huge dental emergency the quicker you get treatment the less chance you may cause other dental complications. Give us a call at 215-568-6222 with all your dental needs! At Philadelphia Dentist we are more than just a dentist office, we change peoples lives with our amazing cosmetic and general dentistry services. A smile makeover is a life changing choice because that is one of the first things people notice when you meet. There are many options at Philly Dentistry that can change your smile completely. From whitening your teeth to getting brand new veneers, there is something for everyone and our great doctors will evaluate your smile to let you know what the best option is specifically for you. One of the most popular cosmetic treatments at our dentistry is teeth whitening. We offer two whitening treatments which are both quick and easy to do. The first option is custom-made bleach whitening trays. These trays are custom-made so that they fit perfectly to your teeth. The great thing about your bleach trays is that you can use them in the comfort of your own home. Just apply the bleaching gel for about ten minutes a day for ten days and your teeth can become up to six shades whiter. This option is great for people that have tooth sensitivity. The next whitening option is ZOOM! Whitening. This option is great for someone who wants their teeth whitened fast. With ZOOM! your teeth can become up to ten shades whiter in just one hour at our office! Sit back, relax, listen to some music and let the ZOOM! do its magic. If you want to completely change your smile in just two visits, then porcelain veneers are the best option for you. Porcelain veneers can just about fix anything that is wrong with your smile. Stains, chips, crowding, gaps, short teeth, you name it and veneers will give you the best smile makeover. Our talented doctors will pick the best veneers that fit perfectly with your smile so that they look natural. Porcelain veneers are extremely strong and can last up to decades as long as you properly take care of them. Get that perfect smile you always wanted and see how a smile makeover could change your life. Nowadays, people are embarrassed to get those old fashion metal braces, especially if you’re an adult. There is a solution now and it’s called Invisalign. Invisalign does the same thing metal braces will do, but on average in half the time. The best part is nobody will notice you have them in because of their clear aligners that shift your teeth into a straight beautiful smile. Very similar to porcelain veneers, Cerinate Lumineers have the same results. Lumineers are different from veneers by the way the teeth are prepared. With Lumineers there is very little prep required because there is no need to sand away any tooth enamel like with veneers. Lumineers are a very thin layer of porcelain that are bonded to the front of your tooth and are made in any size, color, and shape that you want, which will give you an all-natural perfect looking smile. Don’t wait any longer to have that perfect smile. Life is too short to not be completely happy with yourself. So, if there is something small or something big you want to change about your smile Philadelphia Dentistry is the best choice for any cosmetic or general dentist need. Give us a call at 215-568-6222 for a free new patient consultation and see how we can change your life! With the holiday’s right around the corner there is a lot to be smiling about. During the month of December take advantage of our amazing monthly special of $1000 off a set of 8 veneers. 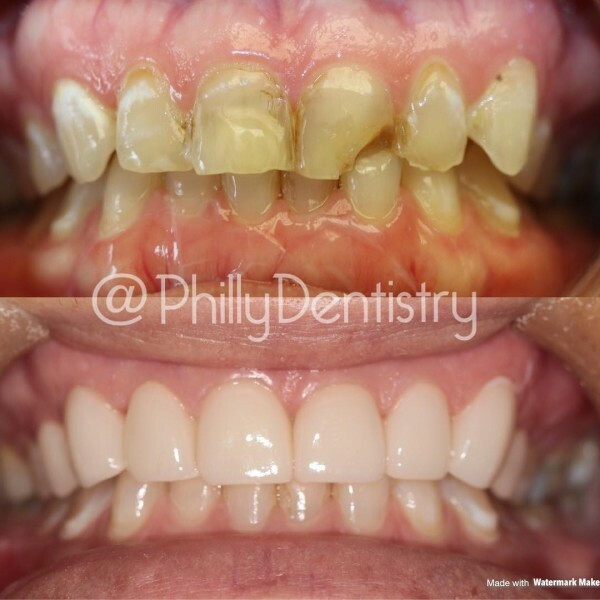 With porcelain veneers you can completely change your smile in just 2 visits to our Center City, Philadelphia office. 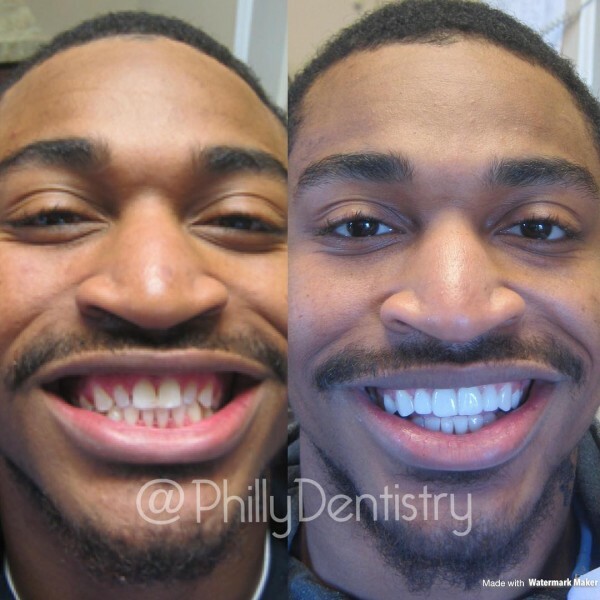 There’s a reason we have done the most veneer procedures in all of Philadelphia, because when it comes to your smile we want nothing, but the best for you! There are many benefits for getting porcelain veneers and like I mentioned above, it’s a really quick process and only takes two visits. Veneers can fix problems like crooked teeth, gaps, stains, and much more. If you have naturally weak teeth from old or damaged fillings, then veneers can strengthen your teeth to give you a healthier looking smile. Stains on the teeth are always a concern for patients especially, if they can’t get rid of them due to antibiotics from a young age. Porcelain veneers can instantly get rid of any stains you have because of the super thin, natural looking veneer that is placed over your original tooth. Porcelain veneers, when taken care of can last up to 25 years! They are resistant to chips and stains and look just like your natural teeth. Even though, they are resistant to stains it is important to take care of them by brushing and flossing daily along with visiting your dentist every 6 months to maintain healthy teeth and gums for life! Do you want to find out if you are a candidate for porcelain veneers? Do you want $1000 off your set of 8 veneers? Give us a call today and schedule your free new patient consultation and let one of our experienced doctors see if porcelain veneers are the best option for you. 215-568-6222. The beautiful thing about cosmetic dentistry is that you can completely change your smile into the smile you’ve always wanted and deserve. Any flaws you may think you have can be corrected with cosmetic dentistry. Whatever the problem may be there is a cosmetic procedure to enhance your smile. 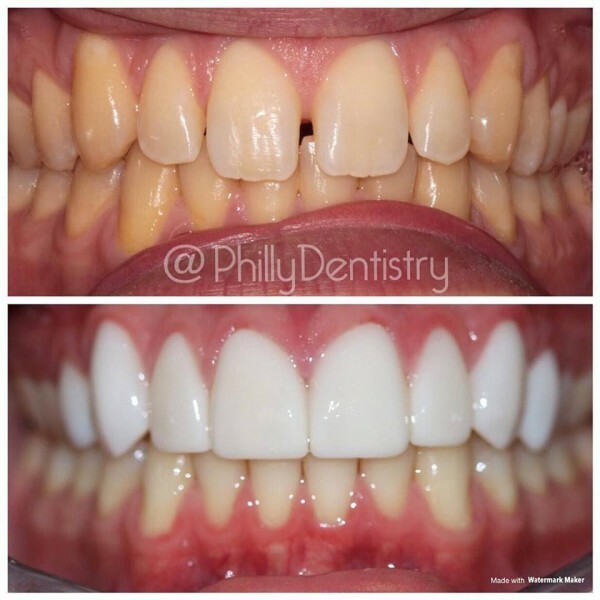 No one is perfect and there may be something that is bothering you like, discoloration of your teeth, or maybe your teeth are not as straight as you want them to be, either way Philadelphia Dentistry is here to help you achieve that perfect smile! When you decide to pursue a procedure with cosmetic dentistry, not only are you correcting your smile, but you are making yourself appear younger while giving yourself a confidence boost. Everyone has the fear of looking older than they really are, but with cosmetic dentistry having a great smile makes you look younger and healthier. Having the smile you always wanted will enhance your confidence and by being more confident your career and personal life will change for the better. What makes Philadelphia Dentistry different from all the other dentist offices in Philadelphia? 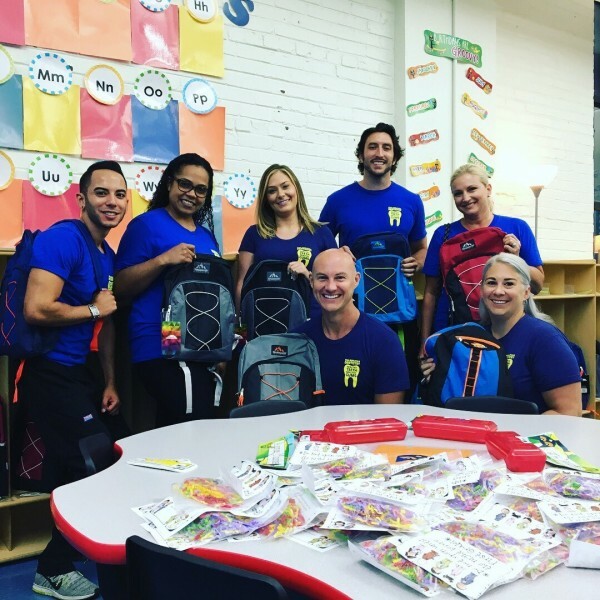 Well, there are many things that sets us aside from other dental offices in Philly and in this blog, I will tell you how Philly Dentistry sets the bar high in the City of Brotherly Love. Here at Philly Dentistry, it is our goal to get our patients healthy, whether it’s your routine cleanings every 6 months or something cosmetic, restorative, preventive or emergency dentistry we are here to help you in any way. We are the largest dental practice in Philadelphia which means we help the most people get healthy. Not only are we the largest, we are 1 of 3 general dentist office’s in Philly that’s an Invisalign Gold Provider. When it comes to Invisalign our patients can start it quicker than any dental office because we provide the latest technology with the iTero Scanner. We are the first dental office to do Lumineers in Philadelphia and we do the most. We also do the most veneer cases too. Our patients love us and that is why we are the only dentistry in Pennsylvania with over 300 positive Google Reviews. More than all our competitors combined! Along with reviews, we also have the most video testimonials from our patients than any other dental office in Philly combined. 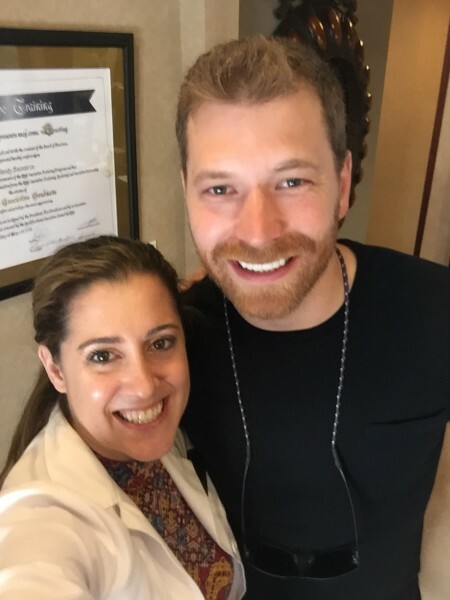 What really sets us aside from our competitors is that the Captain of the Philadelphia Flyers, 76ers players, A-List movie stars, media personalities and award-winning recording artists all choose us for their dental needs. Give us a call today for a free new patient consultation and come see for yourself why we are the best dental practice in the city of Philadelphia. 215-568-6222. We look forward to helping you be happy and healthy for life! Porcelain veneers are one of the most effective ways to transform your smile into a brand new one within the shortest amount of time. Veneers can correct almost every dental problem such as, chips, stains, spaces between teeth, and even fanged teeth. Porcelain veneers are a beautiful, natural way to improve your smile. 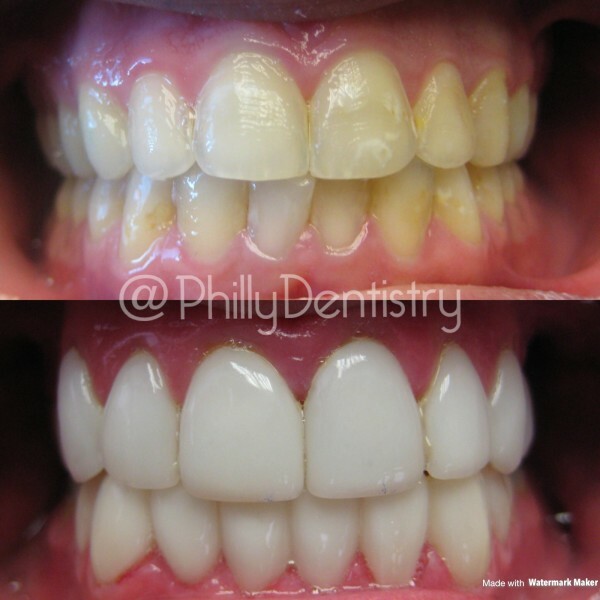 Advantages of porcelain veneers at Philly Dentistry are that it’s a fast procedure! An entire smile can be changed in just 2 visits to our Center City office. Your crooked teeth can be corrected to give you a great smile makeover and give you the confidence you deserve. No more gaps between your teeth because veneers can close any gap you want closed. When your natural teeth are weakened by old or broken fillings, veneers can now strengthen them. Another advantage of porcelain veneers are that they preserve the natural tooth structure and the surrounding soft tissues remain untouched. Lasting longer than bleaching or bonding, porcelain veneers have the durability to last 12-25 years! They are even resistant to stains, chips, and are extremely natural looking. Here are some frequently asked questions about porcelain veneers. How are veneers placed on my teeth? At Philadelphia Dentistry we carefully examine the position of your teeth and what you are seeking to achieve as a final result. Our accomplished doctors precisely reshape your teeth just enough to make a long-lasting, natural-looking new smile. Old-technique veneers required extensive drilling of your tooth structure. Nowadays, this is faster, easier and much more comfortable, which results in veneers that mimic your natural teeth. Once applied to your teeth, you can treat them just like your natural teeth. You brush and floss daily and use no special toothpaste. You do not need to worry about stains or even discolor over time. Mentioned above your veneers have a life expectancy of 12-25 years. You will receive a 5-year warranty against chipping, cracking and any breakage in our office as long as you maintain a cleaning appointment with us every 6 months and wear a protective device called a nightguard after your veneers are placed. During the month of September take advantage of our monthly special of buy 6 veneers and get 2 FREE! Offer valid until September 30th 2018. Give us a call today to schedule your free new patient consultation and see if porcelain veneers are the right option for you. 215-568-6222. Are you embarrassed to smile? Does this hold you back from making the most of life? No one should ever feel timid to smile or laugh. If you want something to change about your smile to make yourself more confident in your everyday life, Philly Dentistry is the best place to get all your cosmetic and general dentistry needs. 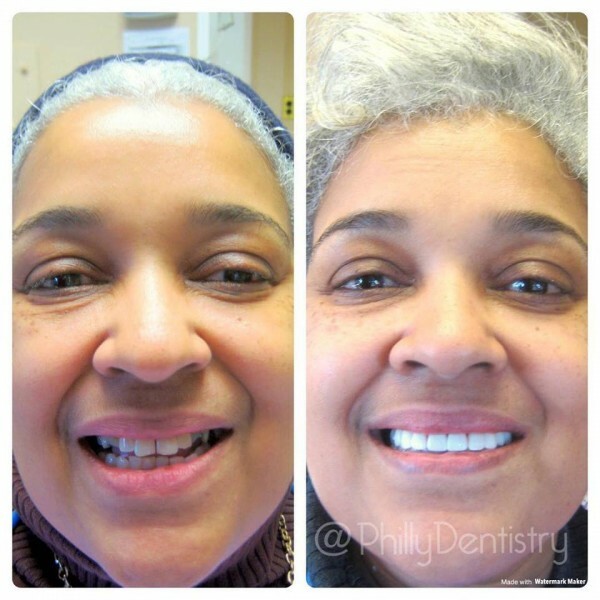 A smile makeover with Philly Dentistry creates a beautiful new smile that will make you look younger, happier, and healthier. There are many different cosmetic dentistry procedures that you can get specifically for whatever your dental needs may be. Chipped teeth? Misaligned teeth? Stains? Gapped teeth? No problem at all! Most dental fixes can be corrected with porcelain veneers from Philly Dentistry. Porcelain veneers are one of the most popular procedures at our dentistry. Patients love the fact that in only two visits they can have a total smile makeover with natural looking, straight, white, and beautiful porcelain veneers. How are porcelain veneers applied? At your first appointment for porcelain veneers you will begin the process with either Dr. Cirka, Dr. Meier, or Dr. Jeon by making an impression of your teeth and then creating a mold of how your teeth will look with porcelain veneers. Next, your impressions will be sent over to our trusted dental lab where they customize the veneers to look perfect for your smile. This process typically takes a few weeks for the lab to create your porcelain veneers and then send them back to our office. Once your veneers are the right shape, color, and size our doctors will then prep your teeth that are receiving the porcelain veneers. Prepping the teeth usually consists of a cleaning and some light sanding so the veneers fit perfectly to your teeth. After the prepping of your teeth the veneers will then be put in place. Once they are placed they will be formed to your mouth shape and face so your smile looks beautiful and most importantly, natural. When you and the dentist are completely satisfied with the appearance of your new smile makeover, a specialized light will be used to dry the cement and permanently bond the porcelain veneers to your teeth. Just like that in only two visits Philadelphia Dentistry could completely revamp your smile! Give us a call today and get that smile you always wanted 215-568-6222. Now that Hollywood’s biggest night, The Oscars are over and you saw everyone dressed their best, hair perfect, and million-dollar smiles, there’s something you should know. It might come as a surprise, but some of Hollywood’s elite stars didn’t always have a straight, perfect, white smile. Many celebrities have gone to see their cosmetic dentist to get a smile makeover because like many people their job deals with being in the spot light. Celebrities spot light may be a little larger than most people, but whether you’re a celebrity, doctor, politician, teacher, sales person, or anyone who deals with people on a daily basis, your smile is one of the first things people notice about you. Here are the top 5 celebrities that you probably didn’t know who had smile makeovers during their career. 1. Nicolas Cage. In Nicolas Cage’s early career his teeth were misaligned pretty badly which made his teeth overlap. In the 1984 movie, “Birdy” Cage got into his role and actually had some of his teeth pulled to look more like his character. As Nicolas Cage and his career advanced to more leading roles he needed a smile makeover and this led him to get a full set of veneers. After getting his smile makeover he got casted in the leading role for “Leaving Las Vegas” which he won an Oscar for. So, we’re not saying veneers won Nicolas Cage an Oscar, but we’re not saying they didn’t help. 2. Ben Affleck. When Ben Affleck was a kid he had buck teeth, it wasn’t until after he had many cosmetic dentistry procedures that he started his acting career. His acting career started with his role in “Good Will Hunting” which landed him a screenwriting Oscar. Ben Affleck’s smile makeover included porcelain veneers, crowns, and some teeth whitening procedures. 3. George Clooney. Being known as one of the most handsome celebrities in Hollywood, George Clooney owes some credit to his cosmetic dentist. Clooney has a full set of veneers and the reason for his veneers were not strictly just for looks. The 2-time Oscar winner had problems grinding his teeth due to stress, which ultimately led for the need to get replacement teeth. 4. Morgan Freeman. Everyone knows Morgan Freeman because he is one of the best actors of all time. As he aged his teeth naturally became more yellow and he had a gap in between his 2 front teeth. After seeing his cosmetic dentist, Freeman had his teeth whitened and gap closed from a dental bonding procedure. Now, Freeman looks younger and is still landing huge movie roles in Hollywood. 5. Tom Cruise. You may remember Tom Cruise when he was a young actor playing roles in movies like “Risky Business” when his teeth were far from perfect. Cruise has had many cosmetic procedures done throughout his career. First, he had his teeth whitened and straightened, but that wasn’t enough for the “Mission Impossible” star. He has reportedly had more cosmetic dentistry treatments which included a mouthful of veneers. Philly Dentistry has many cosmetic dentistry options such as, teeth whitening, porcelain veneers, Invisalign, Cerinate Lumineers, crowns, bridges, implants, and much more. Don’t hesitate to give us a call (215-568-6222) for a free new patient consultation and get that smile you’ve always wanted.